It is an exciting time to specialize in school neuropsychology, with countless theoretically and psychometrically sound assessment instruments available for practitioners to use in their evaluations of children with special needs. Yet the field faces the challenges of establishing evidence-based linkages between assessment and interventions and of broadening its approaches to culturally diverse populations. 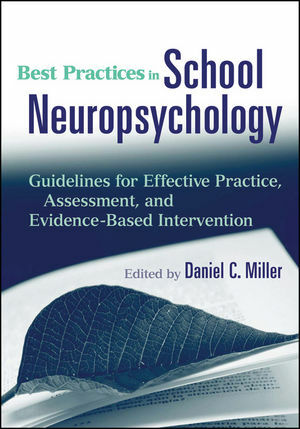 Edited by a leading expert in school neuropsychology, Best Practices in School Neuropsychology: Guidelines for Effective Practice, Assessment, and Evidence-Based Intervention addresses these challenges and their solutions and provides learning specialists and school psychologists with clear coverage and vital information on this burgeoning area of practice within school psychology. Featuring contributions from internationally renowned school psychologists, neuropsychologists, clinicians, and academics, Best Practices in School Neuropsychology is the first book of its kind to present best practices and evidence-informed guidelines for the assessment and intervention of children with learning disabilities, as well as other issues practitioners working with children encounter in school settings. Daniel C. Miller, PhD, is a Professor and Chair of the Department of Psychology and Philosophy at Texas Woman's University in Denton, Texas. He is a former director of the School Psychology Graduate Training Programs and past president of the National Association of School Psychologists. He is the author of Essentials of School Neuropsychological Assessment. Dr. Miller is also the President and founder of KIDS, Inc., a company that specializes in early childhood education and screening products.